Veterans face unique challenges as they transition from military service to civilian life. Going to college is often one of them—but the characteristics that make a successful servicemember also make a successful student. Still, a supportive environment is valuable for helping military students succeed in academia, whether they are planning to obtain a bachelor’s degree, a master’s degree, or a law degree. Here are four important signs that an institution is, in fact, a military-friendly college. Financial aid for veterans is one of the most important signs that a college is military friendly. Most colleges and universities offer aid through the voluntary Yellow Ribbon Program, which offers financial assistance to qualified veterans above and beyond the benefits available under the Post-9/11 GI Bill. (For the 2018-2019 school year, the Post-9/11 GI Bill provided about $24,000 in aid to each qualified veteran.) The U.S. Department of Veterans Affairs (VA) will fully match a college’s contribution to the Yellow Ribbon Program. Not all institutions participate in the program the same way, however. Some colleges only make aid available to a handful of students. Others offer different amounts of aid depending on the program or school within the college. Others may offer as little as $500 in aid per year, leaving veterans with tens of thousands of dollars of expenses to pay—and leaving a lot of aid from the VA on the table. Northeastern University offers some of the most generous Yellow Ribbon Program benefits in the state of Massachusetts. A total of 150 undergraduates are eligible for $30,000 in aid, nine School of Law students are eligible for $25,000 in aid, and 100 graduate students per campus (Boston, Charlotte, and Seattle) are eligible for $24,000 in aid. Northeastern sets these numbers so high—both the amount of aid and the number of students who qualify—as a way to ensure that admitted military students pay little to nothing out of their own pocket, McCarty says. Beyond the Yellow Ribbon Program benefits, Northeastern offers a few scholarships specifically for admitted military students. These include the Patriot Scholar Program, the Phi Gamma Pi Veterans Scholarship, and the Ruby Linn Foundation Scholarships. Don’t assume that a college is military friendly just because it appears on a list of top schools for veterans, McCarty says. Many of those lists are based on surveys and don’t go into a lot of depth about why one school is more military friendly than another. One key indicator that a college is actually military friendly is the presence of a specific office devoted to veteran affairs, such as Northeastern’s CAVS, which opened in the fall of 2015. This office is designed to answer specific questions that veteran students have—such as how to apply for VA benefits, verify eligibility for the Yellow Ribbon Program, and identify scholarships or other options for additional aid. The office can also act as a one-stop shop for general questions about military student life, ranging from academics to housing to disability relations. It’s also important for prospective students to reach out to currently enrolled veterans to get a firsthand account of their experiences at the university, McCarty says. The existence of a student-run veterans organization shows that a college is committed to bringing veterans together—not only to bond over shared experiences but also to deepen community engagement and support each other in achieving their academic and professional goals. Veterans and servicemembers have unique professional and real-world experience. A military-friendly college should give students the ability to transition into a growing or active industry that makes use of this experience. 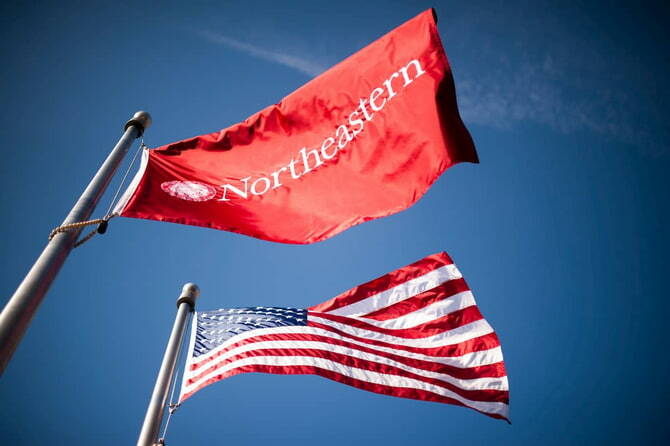 For example, Northeastern’s bachelor’s completion programs let students receive credit for previous military experience while setting their own pace for earning a bachelor’s degree. Advisors work with military students to determine the path to earning a degree that best aligns with their career goals and unique life situation. Meanwhile, the university’s ALIGN Program provides graduate students with paths to careers in science, technology, engineering, and mathematics (STEM) fields. The program offers degrees in fields where veterans possess specific valuable skills, including bioinformatics, energy systems, and cybersecurity. Nearly two-thirds of veterans say they face a difficult transition to civilian life, according to a recent survey conducted by Prudential Financial and the group Iraq and Afghanistan Veterans for America (IAVA). While unemployment rates for post-9/11 veterans have dropped from 12.1 percent in 2011 to 5.1 percent in 2016 (compared to the national average of 4.7 percent), experts who work with job placement organizations say that many veterans struggle with underemployment. These veterans often find themselves in underpaying jobs that do not allow them to use their leadership experience or specialized technical skills. A military-friendly college should have a good track record of placing veteran graduates into careers that make the most of their unique experience. For example, the graduate rate of veterans who attend Northeastern is 83 percent—far higher than the average of 51 percent reported by the VA. In addition, 90 percent of these graduates are employed or back in graduate school within nine months of graduation. McCarty says that Northeastern’s experiential learning model and co-op program play an important role in helping veteran graduates achieve this success. Integrating classroom learning with real-world work allows military students to apply their skills on the job and to connect with a global network of prospective employers. In fact, 51 percent of students who participate in the co-op program receive job offers from previous co-op employers when they graduate. To learn more, explore Northeastern’s military-friendly programs or contact Casey Heaslet, military admissions officer at Northeastern, for personalized enrollment advice.